Tom Cruise’ real name is Thomas Mapother IV. Tom Cruise certainly has a little better ring to it. 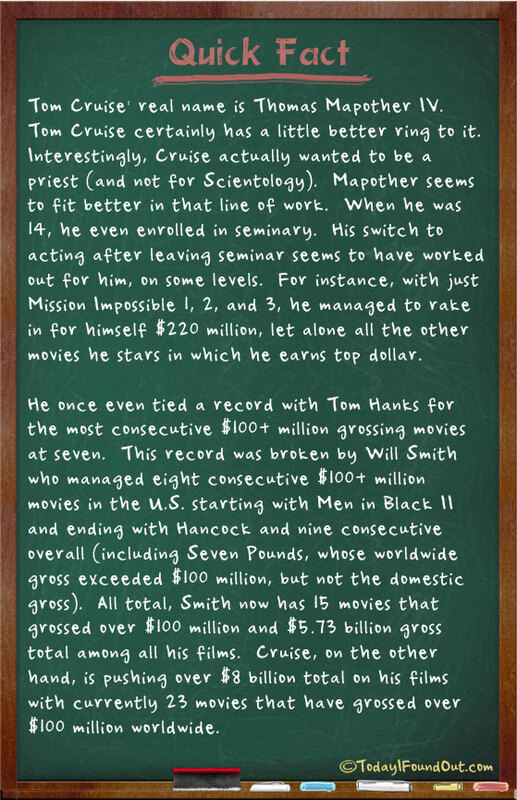 Interestingly, Cruise actually wanted to be a priest (and not for Scientology). Mapother seems to fit better in that line of work. When he was 14, he even enrolled in seminary. His switch to acting after leaving seminar seems to have worked out for him, on some levels. For instance, with just Mission Impossible 1, 2, and 3, he managed to rake in for himself $220 million, let alone all the other movies he stars in which he earns top dollar. He once even tied a record with Tom Hanks for the most consecutive $100+ million grossing movies at seven. This record was broken by Will Smith who managed eight consecutive $100+ million movies in the U.S. starting with Men in Black II and ending with Hancock and nine consecutive overall (including Seven Pounds, whose worldwide gross exceeded $100 million, but not the domestic gross). All total, Smith now has 15 movies that grossed over $100 million and $5.73 billion gross total among all his films. Cruise, on the other hand, is pushing over $8 billion total on his films with currently 23 movies that have grossed over $100 million worldwide. He went to Saint Xavier high school at 14, not seminary school. He did want to be a priest, but St.X (as its called locally) is a all boys catholic high school. This is where his love for drama developed further, when he starred in multiple high school plays.